Like Danny Meyer before him, Gabriel Stulman has navigated the city’s treacherous dining landscape over the years by taking a very small, specific patch of real estate and making it his own. Like Meyer, his restaurants (there are five of them in his personal culinary Yoknapatawpha County around Christopher Street and Seventh Avenue in the West Village) have a distinctive, recognizable style (lively bar; inventively comforting menus; a cheerfully efficient staff, many lured, in the old days, from Stulman’s alma mater, the University of Wisconsin–Madison). And, as with Meyer, it was only a matter of time before one of the city’s hundreds of new hotels would recruit the talented restaurateur to sprinkle his special brand of hospitality fairy dust on a shiny new operation. And so there are three Stulman ventures now up and running at the Freehand, which opened not long ago in a former flophouse on the corner of 23rd Street and Lexington Avenue. They include a posh mixology bar, called George Washington, and Studio, which specializes in more casual, hotel-guest fare. But the most prominent of these, by far, is the cinematically named Simon & the Whale, which occupies a choice corner space off the lobby with its own entrance to the street. An impressive collection of herb boxes have been arranged along the sidewalk outside, and the interior is filled with similar touches. The darkly polished wood bar looks a little like it’s been lifted from an Edwardian gentleman’s club. The tables are made from an African wood called iroko, our chatty waitperson said, and situated among objects (books, glasses, potted cacti) designed to convey that familiar postmillennial combination of bonhomie and obsessively curated “casual” style. 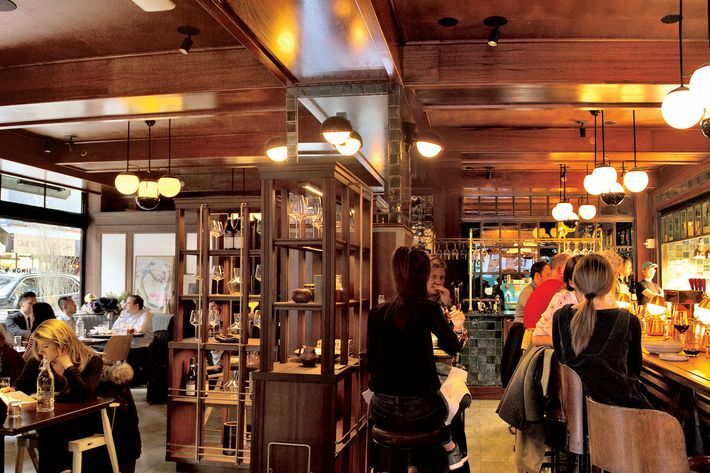 Stulman is one of the masters at pulling together this cozy, accessible look, of course, and with their carefully procured oyster selections and upmarket pub burgers, the menus at his restaurants tend to follow suit. Like Meyer, however, he has a history of finding promising chefs and empowering them to do ambitious things, and the executive chef, Matt Griffin, has clearly been brought in with this in mind. There were oysters tinged with ginger granita and flying-fish roe in our first wave of “snacks,” and a noble if slightly odd-smelling experiment in Instagram bait, which was gamely described as “seafood chicharrón” (made from flattened black-sea-bass skins). There were also walnut-size zeppole folded with bacon, and dense loaves of fresh barley bread created for the restaurant by renowned house baker Zoe Kanan, formerly of Milk Bar and Sadelle’s. Mrs. Platt, a veteran of a thousand dreary fish-tartare appetizers, gave two thumbs up to the version here, which the kitchen flavors with lime and a smoky cream sauce and lays out with care on a thin strip of multigrain toast. 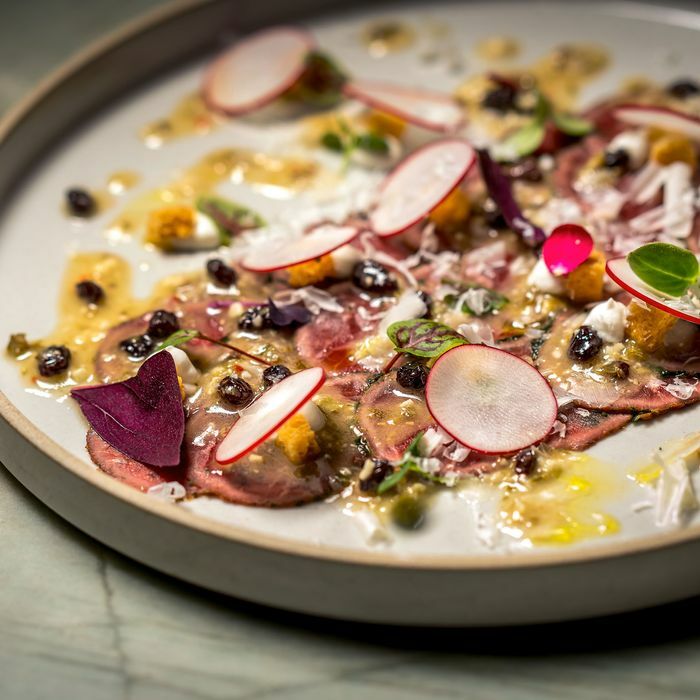 The carpaccio is lamb instead of the usual beef, and the inevitable crudo composition, when it appears, is brightly dressed with shiso, puffed rice, and a splash of coconut milk. Vegivores who choose the prominently lettered “cauliflower” on the menu may be surprised to find that their favorite vegetable is obscured under overly thick ribbons of tongue pastrami, but if squid is your obsession, the dish to get is the squid confit (with mussels, delicate beech mushrooms, and a pleasingly inky mass of black barley), and if you’re an offal lover, it’s the expertly seared veal sweetbreads, flavored with a seasonal, sweet-sour mix of rhubarb and pickled ginger. Like the appetizers, the modest entrée list at Simon & the Whale is dotted with familiar dishes, many of which have been reworked in all sorts of creative, unfamiliar ways. The crunchy, refreshingly porky pork Milanese I ordered one evening was cooked up with an earthy cut of collar, instead of the usual bland cutlet, and the excellent roast chicken was set over a lemony, aromatic stew of wilted greens, enoki mushrooms, and wild rice. 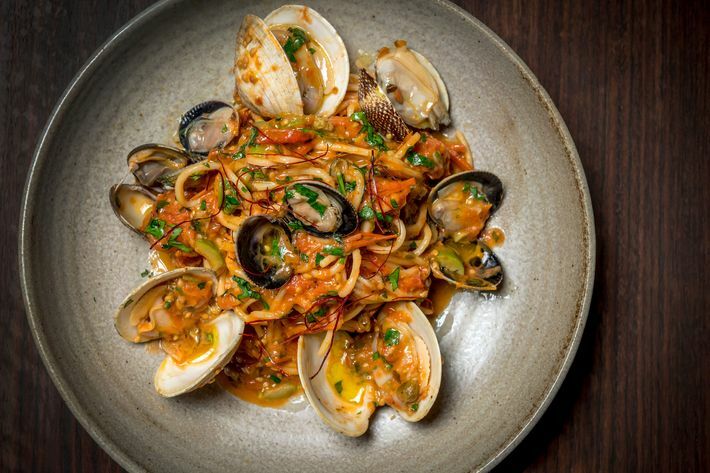 A few of these dishes veer into the overworked category (a baroque fish sandwich on a challah bun, the horseradish-smothered Wagyu flapsteak), but Mrs. Platt enjoyed her spicy, clam-rich helping of spaghetti acqua pazza so much she threatened to order it again, and if you happen to have $60 in your pocket, the Middle Eastern–style whole fish for two (line-caught red snapper, on the evening we ordered it, over a bed of couscous) is worth a special visit. 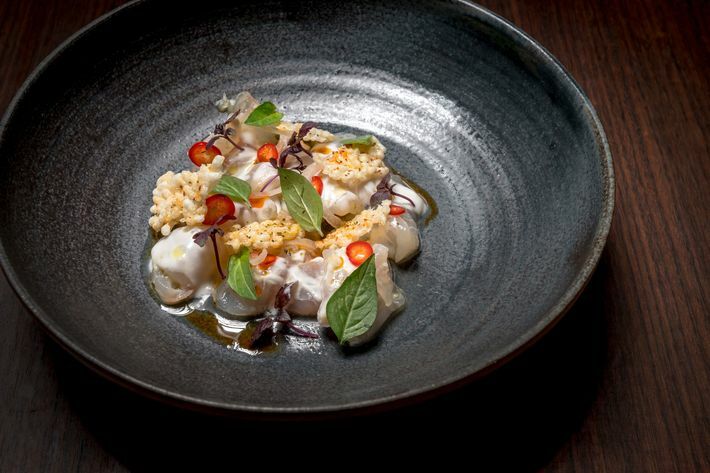 As noted above, Stulman has been one of the pioneers of the kind of modest, terminally pleasant New York restaurant that your grumpy critic has complained loudly about recently, but he and his staff do a good job here of transcending this crowded genre. There are 11 pages of eclectic, well-chosen wines to consider while you enjoy your hotel dinner, and the selection of desserts ranges into the kind of experimental territory rarely seen anymore around this profiterole-and-panna-cotta-saturated town. There is a house panna cotta on the menu, as it happens, although it’s flavored in an oddly pleasing, palate-cleansing way with grapefruit and a hint of wild juniper by pastry chef Charmaine McFarlane. There are sugary custard-filled brioche doughnuts, too, and a refreshingly radical version of bread pudding, which was decked with slices of honey-fried pear and arranged on a bed of ice shavings scented with pine. Prices: Appetizers, $5 to $21; entrées, $18 to $60. Ideal Meal: Black bread, lamb carpaccio and/or squid confit, roast chicken and/or whole fish for two, brown-butter bread pudding. Note: George Washington Bar, upstairs, serves an exceptional bar burger and a first-class martini. Scratchpad: One star for the room and the best of the savory cooking, and another for the desserts.